Pluck - Motor Racing Number, Brooklands comic from October 1923. Homepage. This page: Pluck - Wireless and Adventure Weekly. Copy of "Pluck" children's comic from 1923. Old children's comics rarely survive, they were printed on low-grade paper and were usually destined for the bin shortly after being read. The fact that this comicbook, called Pluck, has survived for over 80 years is little short of amazing. It probably spent all its life in the bottom of a drawer, out of harm's way, otherwise it'd have ripped or been nibbled at by mice after all this time. I bought this one because of the cracking illustration on the cover, by artist Radcliffe Wilson. It shows a pair of 1920s racing cars thundering around the banked track at Brooklands, the motor racing circuit located in Weybridge, Surrey, a site that still exists today, as a museum of motorsport history. Some of the original sections of track remain too, while the remainder has been built over following WW2, when the circuit was used for aircraft manufacture. 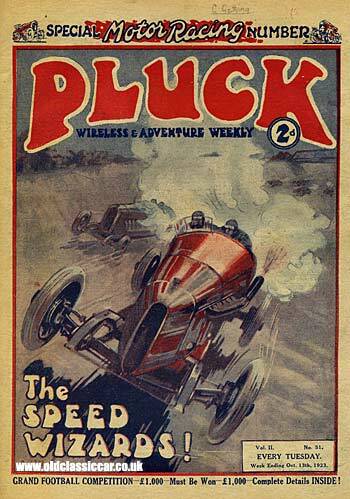 The Pluck comic was a "wireless & adventure weekly" publication, aimed at children (presumably boys mainly) with an interest in things mechanical. This issue is dated week ending October 13th, 1923. The comic itself features various fictional tales of daring deed, with the main series of racing stories headed as "The Speed Wizards", a title repeated on the cover. Page 1 inside the paper is headed "Brooklands Crashes" and talks about some of the amazing shunts that had taken place at the high speed track. Childrens' eyesight in the 1920s must have been fantastic, as the text is in fact tiny. One such story is recalled below, following an account of a crash by Count Zbrowski in his Chitty-Chitty-Bang-Bang racing car (not the film car!). "In the last Brooklands' Automobile Racing Club meeting of the 1922 season, held barely two weeks after the count's smashed, a rather extraordinary accident occurred to a German car - a Benz. The machine was driven by Captain J.F. Duff. He had driven an exceedingly fast and hotly-contested race, and as he hurtled down the finishing straight at anything between 125 and 130 miles an hour his brakes failed. He could not slow the hurtling machine sufficiently to take the turn at the end of the straight. He tried to do it, but the car skidded in an extraordinary fashion, slithered right up the banking, and disappeared over the top, knocking down a telegraph pole on its way. It crashed down amongst the bushes and the small trees beyond, finally bringing up against the ugly spiked railings at the bottom of the slope. That Duff and his mechanician (his ride on mechanic!) were not killed is one of the many unaccountable things that have happened at Brooklands. As it was, both were pretty badly injured. The Benz seems to have been a very unlucky car, for only three months before it caught fire, and nearly a complete lap in flames, belching out clouds of thick smoke behind. Brooklands is generally regarded as one of the safest speedways in the world, and smashes there are comparatively few. That they are bound to happen sometimes is inevitable, but racing men count the thrill of great speed adequate compensation to the hazards; and all the while are learning more and more about the way in which particular types and parts of an engine stand up to the stress and strain of motor-racing - which, after all, is what they most want to know." Following on from these real-world accounts of motor racing at Brooklands, is a story called The Speed Wizards, written by Alfred Edgar and again illustrated (this time in black ink only) by Radcliffe Wilson. The story continues over a number of pages, forming the bulk of the racing content in this issue of Pluck, the 'Motor Racing Number' for 1923. The remainder of the comic-book has other, non-motoring related stories, for young lads who wanted to read about other matters. Return to the car collectables section, or read about other racing items here. A similarly illustrated comic book, this time from 1936, can be viewed here.